Congratulations on your new hot tub! After researching, purchasing, and installing your new hot tub or spa, that doesn’t mean you’re done. There’s more that goes into owning a hot tub than the amount of seating or the water and electricity you’ll consume. 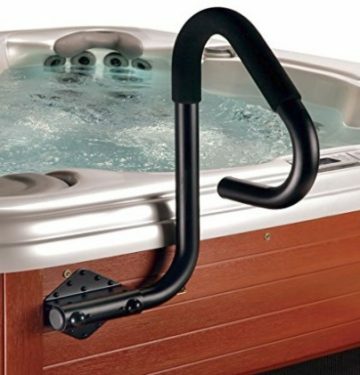 If you’re using the hot tub for thereupetic needs, you might have need of safety equipment for your tub. Whether it’s arthritis in the knees or a bad back, safety steps will ensure that you can get in and out of your tub without injury. It’s important for people who are on the short side, too. If you have short legs, or expect that some of your guests will struggle to get into the hot tub, safety steps are vital. We have plenty of safety step reviews on the site for you to find the perfect set. A railing for safely getting in and out of the tub is essential. Handrails will keep you and your guests from falling. Even if you don’t have health concerns, safety handrails will keep any of your guests from wobbling and slipping as they exit the tub. Everyone’s feet will be wet. The heat of the tub can make people a little dizzy if they spend too long in the hot tub. It’s a good precaution against injury to purchase a handrail. We recommend some great handrails that you can install in the floor or can be slipped under the side of the hot tub. Some swivel, which is a nice feature. Lastly, we have underwater lights for your hot tub. It’ll make the area more festive and help you illuminate the area against dangers. You might be out there at night. You’ll need to see as you climb in and out of the tub. Plus, lights are fun and many of the ones we have change color.